No hard feelings on the set of The Big Bang Theory. Talking about costar (and ex-girlfriend) Kaley Cuoco's sudden engagement, Johnny Galecki told E! News last night at the L.A. premiere of CBGB that he's "very, very happy for her." 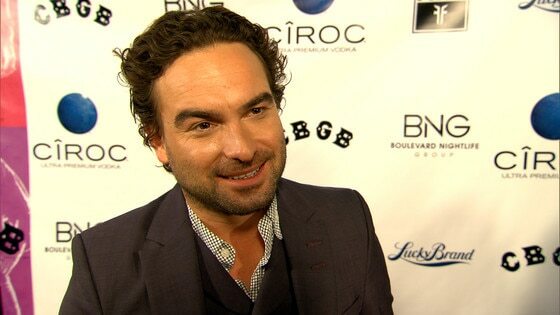 Galecki, who has been dating actress Kelli Garner, was in New York when he got word and they spoke at the time. "She's very happy, which makes me terribly happy," he said. He was not, however, surprised by the news. "I don't think any of us in the cast make any sort of...I don't think we surprise each other anymore at all," Galecki said, laughing. The Big Bang Theory's seventh season premiered last week—and Galecki and Cuoco remain an onscreen couple after some back-and-forth between their characters, Leonard and Penny. And the cast remains close, with Galecki, Cuoco and Jim Parsons even planning to head into battle (aka salary negotiations) together to ask that their individual salaries be bumped up to nearly $1 million per episode for future seasons. Cuoco revealed in 2010, while Leonard and Penny were on the outs, that she and Galecki had dated on the down-low for two years. She and tennis player Ryan Sweeting got engaged after only about three months of dating—but Cuoco finally explained this week just she felt so sure about her fiancé so quickly. "We have all the same family friends," she told Entertainment Tonight. "We grew up with the same people, we just never met. So I kind of feel that I've known him my whole life. I know that it seems a little crazy on paper, but it's what works for us."